Fast becoming our most popular training service! Perfect for dog owners who don’t have the time or the ability to extensively train their dogs during the week. Must have completed an initial Behavior Consult. 16 total sessions: 12 with trainer and dog only, 4 with trainer, owner, and dog. Includes email and phone support as needed,written training plans and exercises, and a professional trainer bait pouch and Kong food puzzle toy. Must have completed an initial Behavior Consult. Pay weekly but an initial 4 week commitment is required. 4 total sessions per week - 3 sessions with trainer and dog only, 1 session with trainer, owner, and dog. Includes email and phone support as needed, written training plans and exercises, as well as a professional trainer bait pouch and Kong food puzzle toy. Fast becoming our most popular training service! Let us do the hard work for you! We can train your dog in your own home and neighborhood, whether it’s some basic manners or part of a behavior modification plan for a more serious behavior problem. 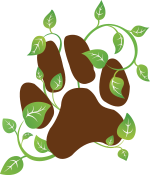 Paws of Nature carries full insurance through Mourer-Foster, Inc.